Preparing for a New Owner: Who Would Buy a 100 Year Old Paper Mill? 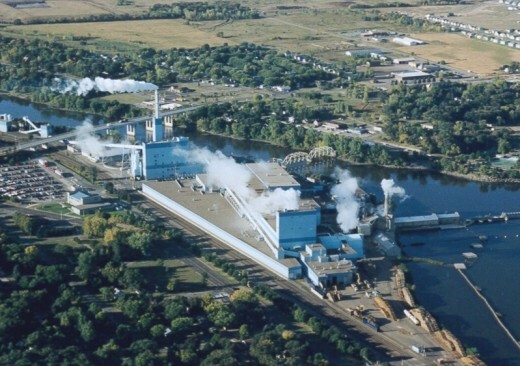 During the months of September 2012 through January 2013, the planning department and commission worked diligently to re-write our industrial zoning standards to ensure the highest quality development (and buyer) we could draw to the 66 acre former Sartell/Verso paper mill site. The hope of finding another paper mill company to buy the site was still the dream of some -- especially the 260 employees who were laid off as a result of the mill’s closure. 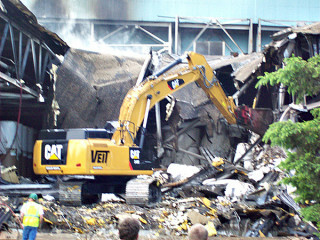 Bulldozers clear debris from destroyed portions of Verso paper mill. Photo for this post courtesy City of Sartell. Verso announced on January 29, 2013 that all assets of the mill would be sold to AIM Development (USA) LLC, headquartered in Quebec. AIM acquired the assets in March for $12.5 million ($11.56 million for the plant, plus $940,000 for an ash disposal/landfill site located off site). AIM’s expressed interest in acquisition was to salvage out and demolish all but two buildings, and then flip the properties for resale. The giant paper mill building -- "big blue" -- would be coming down. AIM was also hoping to explore the reuse of the hydroelectric operations and dam for power generation. But rebuilding a paper mill was not in the future for the site. In fact, the 780,000 square foot “big blue” building was going to be coming down, forever changing the landscape along the Mississippi River. Because AIM proposed a large-scale demolition of the building, it was required to follow the City’s newly adopted Interim Use Permit Process to ensure quality of life; redevelopment and environmental issues would be addressed within a defined period. The process proved to be invaluable as we discovered that environmental and legal hurdles had already surfaced on the site. A proper assurance that quality of life issues would be addressed through the Interim Use Permit was necessary -- and appreciated by the neighbors of the mill site. 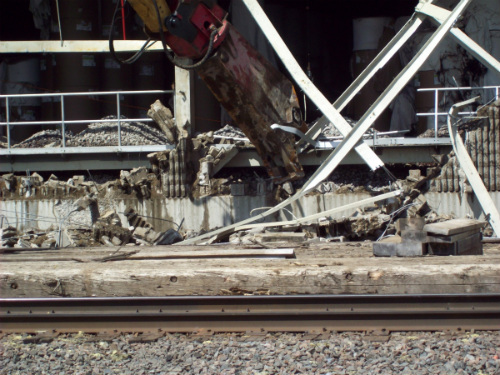 Because the paper mill is adjacent to residential development, it was important to address demolition-related issues such as hours of operation, defined ports of entry for the truck traffic along with traffic flow, storage of materials, and noise. The City was cognizant of the fact the property had been an industrial site for 100 years and that the adjacent residents were accustomed to a certain amount of heavy activity. However, the demolition and dismantling of a 780,000 square foot building is a ginormous undertaking that would take up to 18 months to complete. The potential that AIM Development could strip the property of all its assets (including materials such as copper and metal) and then leave the community with a contaminated site was the cause of many sleepless nights for city staff and planning commissioners. To avoid this result, the proposed Interim Use Permit called for an environmental regulatory plan, including compliance with the Minnesota Pollution Control’s Voluntary Investigative Cleanup Program 1 along with a $4.75 million bond listing the City of Sartell as the sole obligee in the event AIM Development abandons the site without completing the appropriate environmental processes. At the end of August 2013, the 100 plus year old paper mill located along the banks of the Mississippi River was about to go through a transformation as the City Council approved the Interim Use Permit for demolition of the site. The Sartell Paper Mill property presented a unparalleled opportunity for the City of Sartell and AIM to redevelop a place that would attract new industrial, commercial, retail, housing developers and investments, ultimately bringing jobs and economic development to the area. The river and rail impacts presented exciting possibilities, yet these combined with other existing environmental elements required careful analysis. 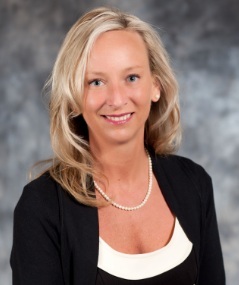 The City and AIM Development mutually agreed upon a development team that understood the importance of facilitating a communications plan or strategy to ensure the immediate and long-term success of the master plan. The necessity for AIM Development to work closely with City of Sartell staff, the City Council, the Planning Commission, business owners, and community members was paramount in developing a compelling vision, which would support the revitalization of the site. As I write this, the planning process is about to begin -- with the goal of preparing a redevelopment master plan that will determine the highest, most practical and feasible use of the property. By next Spring, the plan should be completed. In a future article, I’ll provide an overview of how the redevelopment planning process has worked out and (hopefully) give you a look at the 66 acre paper mill site’s proposed transformation, unveiling a new landscape along the Mississippi River.